Growing up in Asia meant we usually ate Asian food for dinner. My mother loved cooking and discovering new recipes, which she would then share with the family. This means that our traditional family recipes have a lot of Asian influence in them, despite our Belgian origins. These two recipes are memories of my childhood. 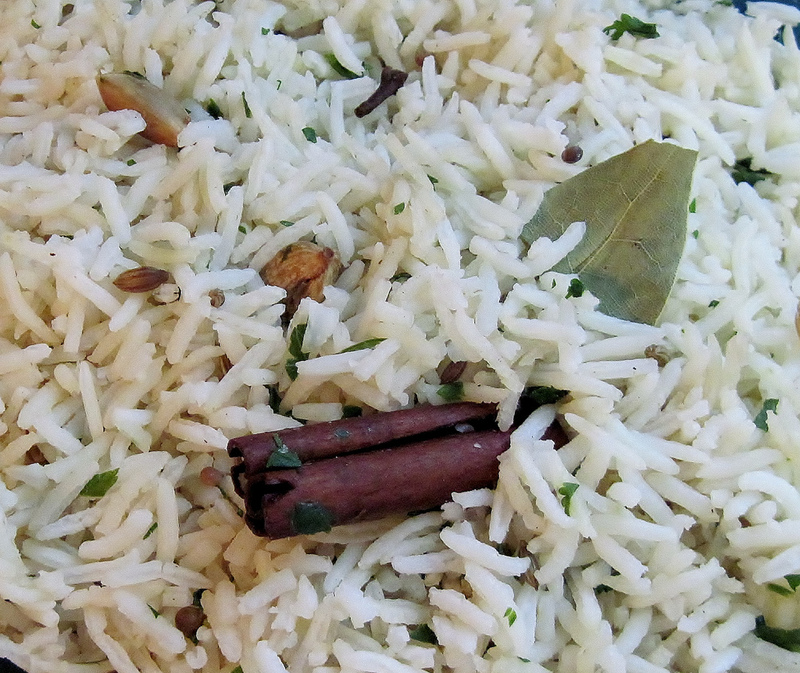 The rice was my mum’s signature dish when she served food to guests, and I have many memories keeping her company in the kitchen when she was preparing it. 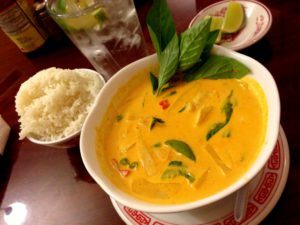 The coconut curry was more of a comfort food, which my parents made when they had leftover vegetables. It never failed to put a smile on our face. Once the rice has been cooked, add the following mixture. This can be also used in other dishes, such as pasta sauce or to accompany fish. Blend everything together and mix with the cooked rice once ready. You can make the sauce ahead of time and mix with rice once you need it. Note: The vegetables can be replaced by other vegetables for variety. Cut the meat into strips and marinate for at least thirty minutes in soy sauce. Add the Maizena flour to the mix. Cut up the vegetables. Open the coconuts by chopping off the top. Make sure you cut the coconut so that it has a little lid, but a wide enough opening. Save the juice. Wok the meat and add the vegetables. Add the condensed milk and a little coconut juice. Once the meat is cooked and the vegetables are slightly softened, fill the coconut with the meat and vegetables. Add some of the juice back to the coconut. Place the lid back onto the coconut and place in the oven for 30 minutes at 180°C. Cook the rice in the meantime. Serve with rice once ready. This year Mach Media is celebrating 10 years and, as you can see, we’re hungry for more! Contact Kaitlyn if you need support with Social Media Marketing or Events.